ITV Central, previously known as Central Independent Television, Carlton Central and popularly shortened to Central Television and Central, is the Independent Television contractor for the Midlands, and was created following the restructuring of ATV and commencing broadcast on 1 January 1982. The station is owned and operated by ITV plc, under the licensee of ITV Broadcasting Limited. ATV attempted to address its problem in 1980 as part of its franchise re-application; with plans for a second major facility in the area (to be based in Nottingham) and as part of the Independent Broadcasting Authority plan for the contract to be a dual region, providing separate news coverage for both the East and the West Midlands. The company name would also be changed from ATV Network Limited to ATV Midlands Limited, thus reinforcing the greater regional focus. The IBA accepted ATV's assertion that ATV Midlands Ltd planned to take a more local identity, and awarded the contract to ATV Midlands Ltd on the basis that further changes were to be implemented, including that the parent company Associated Communications Corporation would divest 49% of its shareholding in ATV Midlands Ltd in an attempt to introduce local shareholders and that ATV Midlands Ltd's registered office should be within the region. To demonstrate this change of share structure, the IBA insisted that ATV change its company name, to show that it was a substantially new company due to the requirements of a dual region. The station opened transmission at 9:25 am on Friday 1 January 1982 with an authority announcement by duty announcer Su Evans, followed by an extended 5-minute promo entitled Welcome to Central, voiced by Peter Wheeler, previewing the company's network and regional programming and the schedule for the first day of transmission. Central initially ran a sole pan-regional service from Birmingham, as a result of an industrial dispute which prevented its East Midlands service from Nottingham commencing before September 1983. The split allowed Central to serve the West Midlands with its own service from Birmingham. There were few differences between the East and West sub-regions, but each had its own news service, advertisements, and during the early years of operation, continuity. This would lead to the BBC launching its own sub-regional service for the East Midlands during the 1980s, which became a region in its own right in January 1991, with the launch of East Midlands Today. By March 1984, the reorganisation of the company was complete, allowing pre-tax profits to double from £3.5 million to £6.5 million in its first two financial years. Shortly afterwards, Zenith Productions was established as a subsidiary of Central Television, which produced programming for the UK and the USA – most famously including the company's television adaptations of the Inspector Morse novels. Central's interests in on-screen fiction saw the company buy the Korda Film Library in 1986. Under its growing business portfolio, Central created CTE (Central Television Enterprises) in December 1987 and opened international bureaux in Hamburg, New York City and Sydney for sales, sponsorship and newsgathering operations. CTE, the company's key international distributor of programming, would later represent output sales for HTV, Meridian and Carlton, who took over Central in 1994. In 1989, the company founded Zodiac Entertainment – an American entertainment firm specialising in the production and distribution of animated cartoons. Central invested $35 million in the company before deciding to discontinue its production business in 1994, leaving Zodiac to become a distributor. Also in 1989, Central established Television Sales and Marketing Services Ltd (TSMS), a joint venture with Anglia Television providing airtime sales and program sponsorships, in part to recover production costs. In March 1994, Anglia acquired Central's stake in the company to take full control with Central moving over to Carlton's sales department. In March 1990, Central formed a partnership with The Observer newspaper to create Central Observer, making environmental themed films for British Satellite Broadcasting and terrestrial channels, with funding from the charity Television Trust for the Environment. Central also profited from the auction after Meridian, a consortium in which Central held a 20% stake, won the franchise to serve the South and South East of England. Post-1993, the company's ITV network presence was further strengthened when it took over commissioning, presentation and compliance responsibility for a number of continuing Thames Television productions, such as Count Duckula, The Tomorrow People, This Is Your Life, Des O'Connor Tonight, Mr. Bean, Minder, Strike It Lucky and Wish You Were Here. Although the IBA required 49% of the new station to be owned locally by companies and individuals, the take-up was nowhere near as expected, leaving companies outside the region to buy shares including DC Thomson (15%), Ladbrokes (10%), Pergamon (9%) and British Rail (2%). Shortly after the station began broadcasting, Australian entrepreneur Robert Holmes à Court – via his Bell Group – started the process of acquiring ACC, but was halted by the IBA, since the law prohibited foreign companies from controlling British television companies. By March, a rival bid from Gerald Ronson's Heron Corporation also entered the race to takeover ACC. In April 1982, ACC was taken-over by Robert Holmes à Court, with the IBA approving the deal in June on condition that ACC's 51 percent stake in Central be put in trust, thus divesting ACC of all voting power until it had reduced its shares in the broadcaster. In March 1987, Carlton Communications acquired 20 per cent of Central from Ladbrokes for £30million which finally gave Carlton its first stake in a terrestrial broadcasting company, after a bid to buy Thames Television was blocked by the IBA two years beforehand. In January 1994 Central was bought in its entirety by Carlton for £750 million The new owners later restructured the company further by combining Central's operations into one and moving its Birmingham studios to a smaller complex elsewhere in the city centre. Network programmes were now classed as Carlton UK Productions and around 140 jobs were lost from the downgraded Birmingham operation. On 6 September 1999, the station was rebranded on-air as Carlton Central, though the registered company name remained Central Independent Television Limited. The new identity, produced by Lambie-Nairn was also used on Central's sister stations in the London and Carlton Westcountry regions. Only the "Carlton" name was used on air, however Central's regional news programmes retained the "Central" brand. With the merger of Carlton and Granada on 2 February 2004, the brand became ITV1 Central. It is currently owned by ITV plc and on 29 December 2006, the registered company name was changed from Central Independent Television Ltd to ITV Central Ltd. This company is, along with most other regional companies owned by ITV plc, listed on www.companieshouse.gov.uk as a "Dormant company". On 5 April 2005, it was revealed ITV Central could be fined by regulator Ofcom for broadcasting a pre-recorded late Central News bulletin for the East Midlands. The regulator later permitted ITV to pre-record some regional news bulletins shortly before transmission. Initially, Central inherited ATV's Broad Street studios, ATV Centre, which was renamed Central House when the contractor changed its name – they were retained as Central's headquarters, West Midlands studios and transmission facilities until 1997. Upon winning the franchise, Central decided to construct new studios for its East sub-region, based in Lenton Lane, Nottingham – the new complex was to be called 'East Midlands Television centre'. Up until the studios were opened, Central's East Midlands operations were based on an industrial estate at Giltbrook, near Eastwood on the outskirts of Nottingham. A temporary radio link from Giltbrook to the Waltham transmitter via BT Bowman/Sheriff (Nottingham) Telephone Exchange provided the contribution feed into the studio/transmission network. The Nottingham studios were to be staffed by employees originally based at Elstree, which led to many problems due to the relocation, including industrial action, which resulted in a long delay for the promised separate news service for the East Midlands until September 1983. The Nottingham studio complex finally opened in January 1984, followed by an official opening by the Duke of Edinburgh on 2 March 1984  Five years later, Central opened a computerized news centre in Abingdon for the launch of its third sub-region, serving the South Midlands. Central News South was broadcast from the Abingdon studios, supplemented by news bureaux in Aylesbury, Gloucester and Swindon. In February 2004, ITV plc announced plans to close and sell the Lenton Lane production centre in Nottingham with over 350 jobs being axed in the process Following the closure of the studios, a new news-gathering centre was established in the city, but production and transmission of Central News East moved to the Birmingham studio in Spring 2005. The former studio complex is now part of The University of Nottingham and is known as 'King's Meadow Campus'. It still maintains one Studio (Studio 7), and this is rented out to television and film companies, generating income for the University. In October 2004, ITV plc closed Central's presentation/transmission department and moved transmission to the Northern Transmission Centre in Leeds. Although there was heavy opposition, the role of presentation and transmission at Birmingham had been significantly reduced after network presentation was centralised to LNN in London in 2002 and so there was an inevitability that this function would be moved out. CITV (Children's ITV), which had been presented by Central since 1983, was also re-homed to Granada's studios in Manchester, with all content pre-recorded and with out-of vision presentation. A documentary about the Broad Street studios was later released on DVD in October 2011. Entitled 'From ATVLand In Colour' (referring to the nickname used on Tiswas, and the building being purpose-built by ATV for colour broadcasting), the documentary featured presenters, actors, announcers and behind-the-scenes staff talking about their time working in the studios, and the programmes that were made there by Central, and predecessor ATV. The five-part documentary, produced by ATVLAND Productions, was followed up in November 2012 by From Headlines to Tight Lines, a DVD on the history of the regional news magazine programme ATV Today. ITV have since also sold the Gas Street office building to Cube Real Estate, a commercial property developer, which has refurbished the interior of the building. While Central maintains office space and a single ground floor studio, the other studio and floors are available to rent as office space. The property is marketed as '22 Gas Street'. The Central South region was disbanded in December 2006 after 17 years in operation – with the eastern half of the area merging with Meridian's North region to form an ITV Thames Valley region. 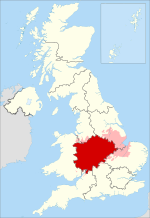 At the same time, ITV West's broadcast footprint was expanded to cover North Gloucestershire from the West's Bristol studios, while Herefordshire re-joined Central News West from Birmingham. While all Thames Valley news programmes were broadcast from Meridian's studios in Whiteley in Hampshire, Central's former Abingdon base was retained as a newsgathering centre. Further changes in February 2009 saw the end of wholly separate programmes for Central's East and West sub-regions. The pan-regional service currently includes a short six-minute opt out within the 6pm programme and separate late night bulletins for the two areas. In the former Central South area, ITV's Thames Valley operations were fully merged with those in Meridian's South sub-region and its former territory – including Oxfordshire, Swindon and Buckinghamshire – was formally transferred to the Meridian region when the regional licence was renewed in 2014. On 23 July 2013, proposals for a more localised Channel 3 news service were approved by Ofcom – ITV News Central extended the East and West opt-out services from six minutes to twenty minutes during the half hour 6 pm programme, in addition to separate lunchtime and weekend bulletins for the two sub-regions. In the former Thames Valley region, plans were approved for a ten-minute opt out within the 6pm edition of ITV News Meridian for the south of England. Upon launch, Central's on screen presentation featured a sphere (which resembled a moon or a total eclipse) which would burst open with light, before reforming, accompanied by a light jingle, but was dropped and revised during 1983, so the moon ident would just appear of darkness with the colour spectrum appearing to its left hand side. This ident was dropped locally in 1985, but remained on the front and end of networked programmes until August 1988. On 2 September 1985, a new presentation package was launched, which saw the moon redesigned into a three-dimensional shape. It was initially used solely for regional continuity purposes, but by 1986, it became an ident in its own right. It did not appear as a pre-programme front ident on network programming from Central, however, it having only been adopted for branding network programmes in April 1988, a few months after pre-programme ITV idents were dropped. The new logo was a circle in shape, but with a curved line running down the left hand side and five horizontal lines dividing the sphere up into twelve segments. The left six segments were coloured red, orange, yellow, green, blue and purple and the whole symbol was computer animated. The symbol, nicknamed "The Aspirin", or more popularly The Cake, would have a variety of form ups, mainly involved with bringing the segments together or applying the colour to the symbol. The soundtrack was the same composition, but played in a variety of different ways. On 25 April 1987, a new promotional package was introduced with a new slogan Let's Get Together. Central also adopted the ITV 1989 generic look as another ident to use alongside the Cake. The generic ident was used in its raw form, with altered music, and as part of another ident giving greater emphasis to the cake but was dropped a year later. Between 1985 and 1997, well over 10,000 different sequences were made by Central's Presentation team in Birmingham, including break bumpers, idents, "next" animations and trail designs, which give the channel a wider range of presentation than any other British television station. The last batch of Cake idents to be created was introduced on 6 January 1997, in which the cake became more abstract with both more advanced computer graphics used and more live action models & sequences (including a physical neon sign version). The cake lasted 12 years before being replaced on 20 April 1998, by adapting a version of the idents used by Carlton who had been using since 25 November 1996. This featured the name Central in the font Gill Sans in centre screen against a bright and colourful background. The idents featured a 2D animation of either the letters interacting in some way, a letter being replaced with another object, or the word being part of a larger scene, such as a cross word of place names in the region. The look was discontinued on 5 September 1999. Central adopted the Carlton 'Star' branding on 6 September 1999, shortly before much of the network adopted the second generic look under the theme of 'Hearts'. The Carlton idents featured an opening film featuring a heart at the end, before a star shaped light came from the heart, engulfing the screen, and showing the endboard, which featured a background of spinning stars in different colours with the brand name centre screen above an ITV logo. The ident itself technically was praised, however the presentational package received complaints and criticisms due to the fact that the Central brand was replaced by the Carlton brand. These idents only featured the Carlton name on screen but the announcements that featured with idents used the name "Carlton for the Central Region" and separate continuity was retained. The Carlton brand continued to be seen on production captions until February 2004, when the caption A Carlton Production or A Carlton Production for Central England being used. This was replaced, following the merger of Granada plc and Carlton Communications to form ITV plc, with an ITV regional logo featuring the word Central below the ITV logo. Today, the majority of productions have been moved away from the Midlands region, and any productions are accredited to ITV Studios. On 14 January 2013, the station's on-air identity reverted to ITV, along with all other ITV plc-owned franchises. Taking over from ATV as one of the 'Big Five' of ITV companies, Central performed strongly on networked output, carrying on several ATV shows, most notably the soap-opera Crossroads and game shows including Bullseye and Family Fortunes. Original programming included comedy series such as Auf Wiedersehen, Pet (more recently revived by the BBC) and the multi award-winning Spitting Image, drama series Boon and game shows such as The Price is Right and Blockbusters. Perhaps the station's most successful drama title was its adaptations of the Inspector Morse novels, produced by its subsidiary Zenith Productions. Central also produced the critically acclaimed film Walter – starring Ian McKellen – for Channel 4's first night of transmission. Less successful was one of Central's first networked contributions – the Tiswas spin-off O.T.T., which drew high viewing figures but also heavy criticism for its racy adult content. It was axed after one series and replaced by a low-budget sequel entitled Saturday Stayback. The company also attracted ire with the 1987 sitcom Hardwicke House (starring Roy Kinnear) about an anarchic comprehensive school. The first two episodes received so much public condemnation that the remainder were never transmitted. Central also formed numerous international partnerships to produce major drama and documentary series – including Legacy of Civilization with Maryland Public Television, Nuclear Age with WGBH-TV (another key PBS affiliate) and NHK and Edens Lost (1989) with ABC. In the field of news and current affairs, Central had enhanced and bettered on ATV's reputation as a regional news provider by becoming the first British television station to offer three distinct services for different parts of the transmission area. It was also a major contributor to current affairs locally and nationally – from its documentary output such as Viewpoint, 30 Minutes and England Their England to more populist series, including The Cook Report and the long-running debate show Central Weekend, which ran for 15 years in the Midlands on Friday nights. The programme was also the first on British television to examine seriously the AIDS virus, leading to a drama series on the topic, called Intimate Contact. Central also first reported on the Ethiopian famine in July 1984 with the documentary Seeds of Despair. In the same year, the company completed production on one of its more controversial programmes Question of Leadership, a four-part series directed by Ken Loach about trade unions' responses to government actions. The IBA was concerned it breached balance guidelines, while the unions criticised it as defamatory. Even after several re-edits, the series was never transmitted, which was described as political censorship. Central also played a major role in the ITV network's infrastructure – not only producing children's and schools programming, but also providing scheduling and presentation services with its dedicated Children's ITV and ITV Schools' strands – the latter moving to Channel 4 in 1987. With the creation of a dedicated ITV Sport network unit, Central also played a significant part in networked sports output under the leadership of Gary Newbon. The station produced nearly all of ITV's football coverage for over a decade – including the FA Cup, UEFA Champions' League, the FIFA World Cup, the UEFA European Championship and Premier League highlights, as well as extensive live regional coverage of Football League matches involving Midlands clubs in The Central Match. The station also played its part in coverage of key European athletics meetings and world championship boxing with The Big Fight Live as a long-standing Saturday night fixture. In 2004, the department was moved to London and merged with the London News Network's operations to form ITV Sport Productions. ^ "Central ITV". Channel 3 Broadcast Licenses. Ofcom. Archived from the original on 15 April 2012. Retrieved 20 April 2012. ^ Rogers, Jeremy. "ATV (Associated Television) History". Independent TeleWeb. Retrieved 20 April 2012. ^ Rogers, Jeremy. "Central Television History". Independent TeleWeb. Retrieved 20 April 2012. ^ Robertson, Jason. "ATV History". sub-TV. Archived from the original on 26 March 2012. Retrieved 20 April 2012. ^ "Korda classics for Central". Thefreelibrary.com. Retrieved 16 December 2014. ^ "/C O R R E C T I O N – CINAR Films Inc./(Correction Notice)". Thefreelibrary.com. Retrieved 16 December 2014. ^ "News Briefs". Playbackonline.ca. Retrieved 16 December 2014. ^ "Philip Jones: Television executive who sold 'Inspector Morse' to the world". The Independent. London. 10 July 2009. ^ "Carlton taps CTE int'l distrib". Variety. Retrieved 16 December 2014. ^ "Wildscreen – Board". Wildscreen.org.uk. Retrieved 16 December 2014. ^ a b "History of Central Independent Television – FundingUniverse". Fundinguniverse.com. Retrieved 16 December 2014. ^ "Inside Lenton Lane – Studios – Transdiffusion". Transdiffusion.org. Retrieved 16 December 2014. ^ Buxton, Roddy. "A trip to Giltbrook". Studio One. Transdiffusion Broadcasting System. Retrieved 20 April 2012. ^ Andrew Ffrench. "TV's Wesley says fond farewell". Oxford Mail. Retrieved 16 December 2014. ^ "The rise and fall of Lenton Lane – Politics – Transdiffusion". Transdiffusion.org. Retrieved 16 December 2014. ^ Buxton, Roddy. "A trip to Broad Street". Studio One. Transdiffusion Broadcasting System. Retrieved 20 April 2012. ^ Claire Cozens. "ITV axes up to 400 jobs as Nottingham studio closes". the Guardian. Retrieved 16 December 2014. ^ "King's Meadow Campus". University of Nottingham. Retrieved 20 April 2012. ^ "The Press Release". ATVLAND.production. Archived from the original on 4 January 2012. Retrieved 20 April 2012. ^ Holmwood, Leigh (20 September 2006). "Launch of ITV region delayed". The Guardian. London. Retrieved 20 April 2012. ^ Brian Butterworth. "Whatever happened to Central South, Meridian Newbury and ITV Thames Valley?". UK Free TV. Retrieved 16 December 2014. ^ Amanda Williams. "ITV under fire over new regional show". thisisoxfordshire. Retrieved 16 December 2014. ^ "Central: Idents". TV Live. Retrieved 20 April 2012. ^ "Central Ident 1982". YouTube. Retrieved 20 April 2012. ^ "Central: 1982–1985". TV Live. Retrieved 16 December 2014. ^ a b c d "Central Index". TVARK. TVARK. Archived from the original on 27 January 2012. Retrieved 25 July 2011. Pages contain video images of all the idents. ^ "More Central". TV Live. Archived from the original on 20 December 2016. Retrieved 16 December 2014. ^ a b "Central: 1998–2006". TV Live. Retrieved 16 December 2014. ^ a b Barnes, Steve. "Carlton Midlands Index". TVARK. TVARK. Archived from the original on 18 March 2012. Retrieved 25 July 2011. Contains videos of the idents. ^ "Seeds of Despair". BFI. Retrieved 16 December 2014. ^ "TVARK – Central Television Programmes". Tv-ark.org.uk. Archived from the original on 4 March 2016. Retrieved 16 December 2014. ^ "The Guilty". BFI. Retrieved 16 December 2014. ^ "Home Front". BFI. Retrieved 16 December 2014. ^ "Picking up the Pieces". BFI. Retrieved 16 December 2014. ^ "TALES OUT OF SCHOOL (1983)". Britishtelevisiondrama.org.uk. Retrieved 16 December 2014. ^ "TECX (TV Series 1990– )". IMDb. 7 July 2007. Retrieved 16 December 2014. ^ "The Shell Seekers". BFI. Retrieved 16 December 2014. ^ "Scene Southwest". BFI. Retrieved 16 December 2014. ^ "Kind of Living". BFI. Retrieved 16 December 2014. ^ "All Cricket and Wellies". BFI. Retrieved 16 December 2014. ^ "All in the Game". BFI. Retrieved 16 December 2014. ^ "Eh Brian, It's a Whopper". BFI. Retrieved 16 December 2014. ^ "The Nineteenth Hole". BFI. Retrieved 16 December 2014. ^ Mark (13 July 2010). "Troubles and Strife (TV Series 1985–1986)". IMDb. Retrieved 16 December 2014. ^ "Wayne Dobson – A Kind of Magic". BFI. Retrieved 16 December 2014. ^ "24 Hours". BFI. Retrieved 16 December 2014. ^ "The Album Show". BFI. Retrieved 16 December 2014. ^ "Ancient Lives". BFI. Retrieved 16 December 2014. ^ "Apollo 13 To the Edge and Back". BFI. Retrieved 16 December 2014. ^ "Chicken Ranch". BFI. Retrieved 16 December 2014. ^ "England Their England". BFI. Retrieved 16 December 2014. ^ "First Cut". BFI. Retrieved 16 December 2014. ^ "Heart of the Country". BFI. Retrieved 16 December 2014. ^ "Home Town". BFI. Retrieved 16 December 2014. ^ "Jesus 2000". BFI. Retrieved 16 December 2014. ^ "Look Good, Feel Great". BFI. Retrieved 16 December 2014. ^ "Loved Ones". BFI. Retrieved 16 December 2014. ^ "On the Ball". BFI. Retrieved 16 December 2014. ^ "Our House [Itv Regional, 1996– ]". BFI. Retrieved 16 December 2014. ^ "Sob Sisters". BFI. Retrieved 16 December 2014. ^ "Sky High (TV Series 2001– )". IMDb. Retrieved 16 December 2014. ^ "The Night the Bombs Went Off". BFI. Retrieved 16 December 2014. ^ "Struggle for Democracy". BFI. Retrieved 16 December 2014. ^ "The Tuesday Special". BFI. Retrieved 16 December 2014. ^ "Perspectives on History – AHA". Historians.org. Retrieved 16 December 2014.